[S746] Wikipedia, online http://Wikipedia.com, http://en.wikipedia.org/wiki/Alexander_Montgomerie,_1st_Lord_Montgomerie. Married Name: Her married name was Harrington. [S1115] 1911 Canada Federal Census, on-line. [S367] April 1881 Canada Federal Census, 101 Newbury Street, Boston, Suffolk, Massachusetts, USA. Married Name: As of circa 1175,her married name was Mac Somerled [of Galloway]. Biography*: Sir Colin Campbell of Lochow, the real founder of the family, sixth in descent from the first Gillespie, distinguished himself by his warlike actions, and was knighted by King Alexander the Third in 1280. He added largely to his estates, and on account of his great prowess he obtained the surname of Mohr or More ("great"); from him the chief of the Argyll family is in Gaelic styled Mac Chaillan More. Married Name: Her married name was MacRanald. Biography: Red Hector of the Battles Maclean, or Eachann Ruadh nan Cath in Scottish Gaelic, was the 6th Chief of Clan Maclean. He was the son of Lachlan Lubanach Maclean, and he early distinguished himself by daring exploits, and was noted as being one of the best swordsmen of his time. He became so celebrated as a swordsman, that many knights who had gained for themselves renown came from distant parts to measure weapons with him. One of these was a renowned knight of Norway, who challenged Hector Roy to mortal combat. The challenge was accepted. They met at Saleu, in Mull, where they fought, and where the Norwegian fell. A green mound and cairn on the sea-shore mark the spot where Hector had his antagonist buried. There was an old Gaelic poem, which affirmed that Hector commanded a great fleet to the coast of Ireland, and there defeated some of the ships of the King of England. He landed his troops; placed the city of Dublin under contribution; carried fire and sword into the country; destroyed many of his enemies, and burnt their houses. This must be the expedition hinted at in Raphael Holinshed's Chronicle of Ireland where it is recorded that "in the year 1400 at Whitesuntide, the first year of King Henry IV, the constable of Dublin, and divers others at Stanford in Ulster, fought by sea with the Scots, where many Englishmen were slain and drowned." Ewen Cameron XIII Chief of Clan Cameron and a large body of Camerons, joined by Alexander MacDonald of Lochalsh, Clan Ranald of Garmoran and Lochaber and the Chattan Confederation - who they must have made peace with on a raid into the county of Ross-shire. 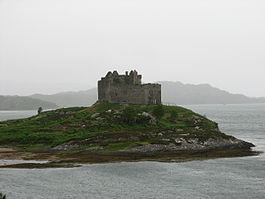 During the raid they clashed with the Clan MacKenzie of Kintail. They then advanced from Lochaber to Badennoch where they were even joined by the Clan MacKintosh. They then proceeded to Inverness where they stormed Inverness Castle and MacKintosh placed a garrison in it. The Lords of Lochalsh appear at this time to have had strong claims upon the Camerons to follow them in the field. They were superiors under the Lord of the Isles of the lands of Lochiel in Lochaber, in addition to the claims of a close marriage alliance (Ewen married a daughter of Celestine of Lochalsh). This would serve to explain the quite unusual mutual participation under a common banner between the Camerons and Mackintoshes in this raid. [S746] Wikipedia, online http://Wikipedia.com, http://en.wikipedia.org/wiki/Hector_Og_Maclean,_13th_Clan_Chief. Biography*: Hector Og Maclean, or Eachann Óg Maclean in Scottish Gaelic, (circa 1540-1573) was the 13th Chief of Clan MacLean. Hector Mor Maclean was succeeded by his son Hector Og Maclean, also known as Hector Maclean the Younger. Hector Og lived only five years longer than his father. During which short period he not only spent, by his improvident conduct and profligacy, all the ready money left by the late noble chief, but burdened the estates with debt. He appears to have inherited nothing of the qualities which distinguished his father, but lived at peace in the free enjoyment of his pleasures. He was the only worthless chief of MacLean. He appears to have built for himself a residence at Iona, situated near the head of Port-a-Churraich, where traces of the house are still shown. Hector Og Maclean married Janet Campbell, daughter of the Archibald Campbell, 4th Earl of Argyll, in the year 1557. [S746] Wikipedia, online http://Wikipedia.com, http://en.wikipedia.org/wiki/Hector_Mor_Maclean,_12th_Chief.